Boy, was our weekend jam packed! Friday night, I cleaned the whole house, top to bottom. Why is this even remotely interesting? Because it was the first official top-to-bottom cleaning of the new house. Don't get me wrong, it's not that I haven't cleaned in a month. It's just been disorganized and disheveled cleaning while we were still unpacking. Now that the home-setup is done and life is relatively back to normal (somebody explain normal to me...please?) I am running through the normal cleaning in about 2.5 hours. That's vacuuming, mopping, cleaning bathrooms, washing down the kitchen, putting stuff away and starting on laundry (while Hubby thankfully and attentively attends to Baby Girl). I also got dinner in there somewhere. Not bad, I say. Now, if we can just work on keeping it that way through the remainder of the week. So, while we're on cleaning, here's a little cleaning tip for Tip Tuesday: clean your ceiling fans using an old pillow case cover. It keeps all the dust and grime inside without getting everything all over your linens, floor and furniture below. With this tip,fan cleaing is a cinch and done in about 5 minutes, rather than 30! Just throw the cases into the wash with your dish towels and dust rags when you're done! If you don't have an old pillow case, pick a pair of cheap ones up at TJ Maxx or Marshall's on your next outing. Okay - moving on: Why did I clean on a Friday night when we're just going to be in the house making a mess all weekend? Well, Baby Girl's birthday party number 2 of 3 was on Saturday! We had our friends, Mike and Rachel and their two kids (2.5 years and 10 months) over for a BBQ and pool party. Our friends, John and Michelle stopped by too (we've known John since college, an old buddy of Hubby's). Our other friends unfortunately were very ill, so we really missed them and their two kids. 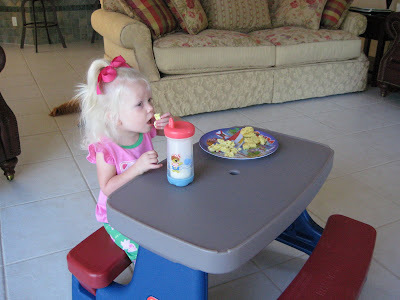 Mike and Rachel, two of Baby Girl's Godparents, got her a Little Tikes picnic table...she LOVES it!!! She also got a bean bag from Mommy and Daddy, some more art supplies from Granny and Grandaddy and several dresses from Grandma and Geezer (the Geezer part is a whole other post - think of him as Grandpa!) Grandma and Geezer will be down in a couple weeks for party #3! She is also received a bracelet and book from Godmother Auntshleigh. Auntshleigh is starting a classic book collection for Baby Girl and the first book is Anne of Green Gables with an inscription from Auntshleigh inside. I think I'm going to read it myself! Time for another side-note. I received an email from BabyCenter the other day wishing my "Preschooler a Happy Birthday." Okay, since when is a two-year old a preschooler? I'm not ready for that yet! However, I don't think I should call her Baby Girl anymore either. So from now on, I'm going to call her "Lallie." This is a nickname made up for her, unintentionally, by Mike and Rachel's son. He couldn't pronouce her name, so it came out Lallie. Since this is close to her real name, but "no cigar," this is now her blog name. Back to the weeknd recap - Sunday, of course we went to church and Lallie made it through the entire children's sermon - for the second week in a row!! I'm so proud! However, we did spend the rest of thh time in the cry room. Uggg....we're getting there! I wore my new Lilly shopper's skirt that I recently bought from Hopsy/Kappa Prep. I don't know how she let this skirt go. It is so cute and comfortable, I wore it all day! I usually take my church clothes off right after, but this skirt was just so comfy I didn't want to take it off! It looks sort of like Largo Skirt Lawn Printed skirt currently out in the Lilly line, in lay and colors (pink and green...yes!) but mine is from a year or so ago - it has monkey's in the print which had Lallie screaming "monkey, monkey" over and over again at the beginning of church! So cute! So, there you have it! A day late, but oh well! She is so darn cute and I love that Lilly skirt! 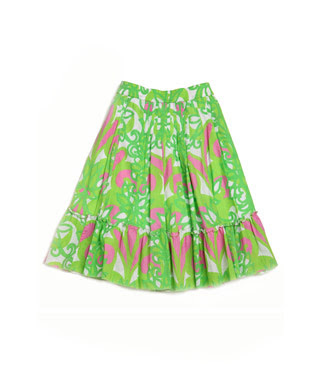 Love that Lilly skirt!! So cute! My pillow case tip is to use cheap ones (especially those jersey/t-shirt sheets that were popular a few years ago) for storing hats. I place a dressy hat in a pillowcase, then use a few straightpins to secure it. Keeps them dustfree on a high shelf, and in perfect condition for Oaks/Derby or a fancy wedding!